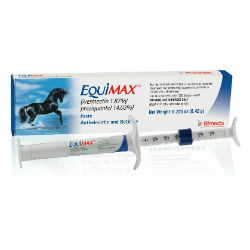 A single syringe contains enough active ingredients to treat horses weighing up to 1,320 lb. This syringe contains sufficient paste to treat one 1320-lb horse at the recommended dose rate of 91 mcg ivermectin per lb (200 mcg/kg) and 0.68 mg praziquantel per lb (1.5 mg/kg) of body weight. Each weight marking on the syringe plunger delivers enough paste to treat 220 lb (100 kg) of body weight. While holding plunger, turn the knurled ring on the plunger 1/4 turn to the left and slide it so the side nearest the barrel is at the prescribed weight marking. Lock the ring in place by making a 1/4 turn to the right. Make sure that the horse’s mouth contains no feed. Remove the cover from the tip of the syringe. Insert the syringe tip into the horse’s mouth at the space between the teeth. Depress the plunger as far as it will go, depositing paste on the back of the tongue. Immediately raise the horse’s head for a few seconds after dosing.